Provides guidance through your inner journey and spiritual awakening. You'll find articles and videos. 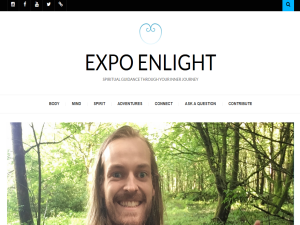 This what your Expo Enlight Blog Ad will look like to visitors! Of course you will want to use keywords and ad targeting to get the most out of your ad campaign! So purchase an ad space today before there all gone! We can only live in a reality we believe to be true. Here's how I changed my reality from grey and depressive to colourful and magical. How you create your own reality with your beliefs. This is essential for our wellbeing. We can only live in a world we believe to be true, but what we choose to believe in is completely up to us. Stress leads to anxiety, depression, high blood pressure and a whole lot more. Here is how to stay in control of your stress and health. Peace. If you are the owner of Expo Enlight, or someone who enjoys this blog why not upgrade it to a Featured Listing or Permanent Listing?